We're not shy about our love for Chipotle -- we even went so far as to order everything on the menu in one single, glorious burrito. But are we devoted enough to eat it every single day? Hm, hard pass. 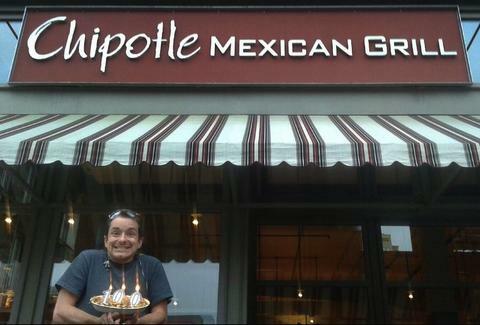 Apparently, though, one brave soul is: Mark Rantal, a graphic artist and improv comedian from Colorado Springs, CO, has been eating Chipotle for lunch every single day. For over 100 days. At the time of this article's publication, Rantal had consumed exactly 106 days worth of Chipotle lunches. Rental told ABC News, "The whole thing was totally an accident. On Monday I decided to get Chipotle and on Tuesday I made the same decision, then got lunch with my friend there on Wednesday... We laughed about it at lunch and he asked how long I thought I could go. And that began the thought." We have a lot of thoughts too -- like, what if we just quit our jobs to follow Taylor Swift on tour forever. But we're not going to do that, because that's a terrible idea. Probably. Apparently, Rantal is also sticking to the exact same order: a burrito bowl with white rice, pinto beans, fajitas, sofritas, mild salsa, corn, medium salsa, cheese, and lettuce. So, the most boring thing you could possibly order. Last week, in celebration of 100 days of Chipotle, Rental did an AMA on Reddit (which was later removed because it didn't meet Reddit's requirements), in which he told users he's doing super well eating the same thing every single day and definitely wasn't crying as he was typing!!! He said he's gained 14lbs so far, which he had wanted, after having lost that weight on a vegetarian diet. And as for how long he'll carry on with the daily Chipotle? "I'm still going to keep the streak going for now (It's delightfully habitual, and I've built awesome friendships with the people who make my food)." he wrote. Rental also let the Internet know his bowel movements are "really consistent." So, there's that. Update - July 21st, 2pm: According to Business Insider, there is a man who has eaten Chipotle for 153 days straight. Everyone is insane. Lucy Meilus is a staff writer for Thrillist and wouldn't do this for all the riches in the world. Or... maybe. Follow her on Twitter at @Lucymeilus and send news tips to news@thrillist.com.